Beauty Blog by Angela Woodward: How can I make my Eyes Look Bigger? I’m in love with all things hair, makeup, fashion and beauty. On this blog you can find anything from reviews on lipstick to supplements, as well as recipes alongside tips to protect your hair this summer! I’m your average girl. I get break outs, I have dry skin, and I like looking and feeling good. I hope I can help you by sharing what I love! If you have any questions let me know by filling out the form on the right hand side of the page! How can I make my Eyes Look Bigger? I got this question a couple days ago and I have to apologize that I didn't get it to is sooner! I was hoping I could grab a model to do the techniques I am going to tell you about on and take pictures. Unfortunately I will not have access to a model until Sunday, so here we are. The question was "Do you have any ideas on how to make my eyes appear larger and rounder than they normally would?" Making your eyes look bigger (or smaller) is all a matter of highlighting and contouring. I know a lot of people think of their cheeks and jawline when they hear those words but when ever you apply makeup to your face that is lighter than your natural skin tone you are highlighting, and when it is darker you are contouring. So if you are ivory and you apply brown eye shadow, you have just contoured your eyes. Here are a few tips and tricks to make your eyes look bigger with the use of makeup. When your eyelashes are long it directs the viewers eye up and down, which is good when trying to make your eyes look bigger! So follow these tips on the post Eyebrow and Eyelash Tips and Tricks to help make your eyelashes grow long and strong! Also use a mascara that lengthens and defines like Revlon 3D Photo Ready Mascara which is also mentioned in the post. Like I mentioned before, use a good mascara (I recommend Revlon 3D photo Ready). When you apply it place the brush at the bottom of the lash line and then move it from side to side slightly as you work it's way up through the lashes. Apply the mascara immediately a second time but this time begin at the lash line and roll the brush as you work your way up. Once you reach the top swipe the mascara wand across the tips of your eyelashes 2-3 more times, to build an elongated look. Also make sure you use mascara on your bottom lashes. Start by applying white eyeliner to your water line. I prefer to use either NYX or MAC white eye pencil liners. Continue by applying the white eyeliner to the water well of the as well. Then apply a darker eyeliner just below the waterline, along the lash line. You should also apply the darker eyeliner to the top lash line along the outer edge. Both on the top and bottom lash line the eyeliner should get thicker at the outer corners of the eye. Now you need to apply a darker eye shadow to the eyelid all the way up to the crease. If you would like to extend the eye shadow past the eyelid to do a color pop or a "winged" look, that will also make your eyes look much larger. Then apply a cream eye color or facial highlighting pen on the inside corners of your eyes (by the water wells) and on the insides of your nose. 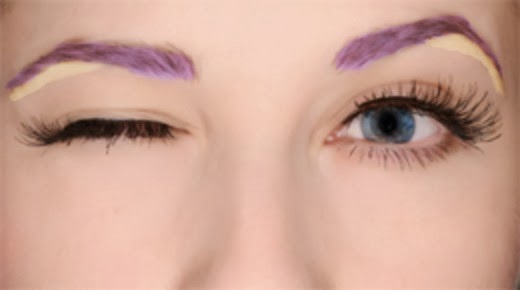 It is also very important to fill in your eyebrows (a technique that can also be found and explained in the post Eyebrow and Eyelash Tips and Tricks) and then high light the brow bone with a cream eye color or a facial highlighting pen as well. Thank you for reading and then commenting on my post! I appreciate your support and I hope my blog has been helpful to you! Let me know if you have any beauty related questions or products you'd like reviewed by sending me a message using the contact form on the right (which can not be seen on mobile devices). Why do I see Salon Products at Walmart sometimes? How can I make my Hair Grow Faster? How can I make my Makeup Last All Day? How can I Re-Hydrate Dry Hair? How do I Wash my Makeup Brushes? Why is Hair More Prone to Breakage When It's Wet? How Can I Get Rid of My Greasy Hair? Pictures are all property of Angela Woodward. Designed by Jenisse Photography & Design. Powered by Blogger.